Your little cereal munchers may be tearing through a forest’s worth of cardboard waste, but fear not – those colorful boxes can also make for a artistic diversion on a rainy day. For Inhabitat’s Spring Greening Design Contest, Chris Kaasman and his wife pieced together a map of the United States from their breakfast empties, then mounted their handiwork on a wall for all to admire. Who says geography can’t be fun? Your little cereal munchers may be tearing through a forest's worth of cardboard waste, but fear not - those colorful boxes can also make for a artistic diversion on a rainy day. 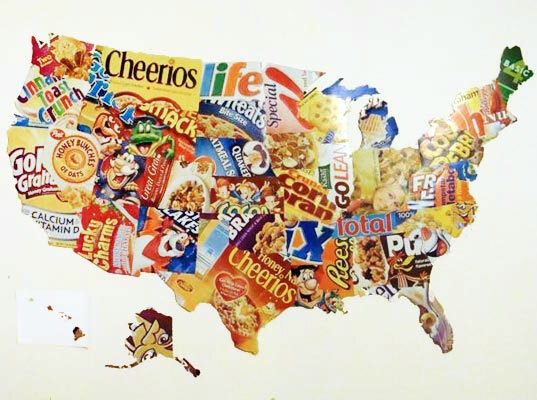 For Inhabitat's Spring Greening Design Contest, Chris Kaasman and his wife pieced together a map of the United States from their breakfast empties, then mounted their handiwork on a wall for all to admire. Who says geography can't be fun?